Saltery Bay Provincial Park was established in 1962 to provide ocean access on the Sunshine Coast of Georgia Strait. The park is divided into two separate sites: the campground and the day-use area. The day-use area with its rocky beaches is a popular swimming and picnic site. Lush forests with large, old trees create a quiet setting for the campground at Mermaid Cove. At low tide, the rocky shoreline often has tidal pools with starfish, sea urchins, small fish and crabs. Scuba diving provides a close-up look at the abundant marine life and a 3-metre bronze mermaid statue. The Emerald Princess statue and wheelchair access ramp were placed in the park through efforts of local scuba enthusiasts. From the shore, killer whales and sea lions can sometimes be seen. Mounds of seashells called “middens” indicate that this was a traditional gathering area for First Nations. Scuba divers will find a 9 ft. bronze mermaid at 10 fathoms in front of Mermaid Cove. There is also a change room and shower facilities. A disabled access ramp for scuba divers is best used during high tide. There is also a disabled change room, shower and toilet. The rocks along the shoreline can be slippery at low tide; please use caution while on these rocks. 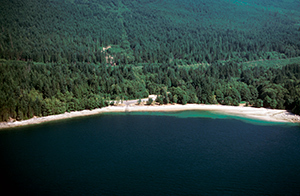 The campground is approximately 1 km north of Saltery Bay ferry terminal on Hwy 101,27 km south of Powell River. The day-use area is located 1.5 km north of the Saltery Bay campground on Hwy 101; from there you can launch your boat or have a picnic and enjoy the beautiful view. History: Named for the fish saltery that was nearby in the early 1900’s. The shallow offshore waters in the vicinity of this park offer an assortment of marine life, underwater caves and shipwrecks which attract divers from all over the world. Cultural Heritage: First Nations people played a significant cultural role in the history of the Powell River area. Mounds of seashells called “middens” indicate that this was a traditional gathering area for First Nations. Wildlife: An abundance of marine life is found in the ocean area around the park. At low tide you will often find tidal pools that harbour urchins, star fish, small fish, and small crabs. Please do not disturb their habitat. Canoeing and kayaking in ocean area; know the ocean currents. Contact the Powell River Chamber of Commerce (604) 485-4051 for information on kayak/canoe rental companies. Bicycles must keep to roadways. There are no specific bicycle trails. Bicycle helmets are mandatory in British Columbia. Good tidal fishing. Anyone fishing or angling in British Columbia must have an appropriate licence. The Mermaid Cove Trail starts at the bridge over Park Creek near the entrance to the Campground. It is an easy 1 km hike through 90 year old second growth stand of forest. Some sections of the trail traverse short sections of rocky out crops where footing may be slippery. The trail is for hiking only and is not suitable for wheel chairs. It takes approximately 30 minutes to walk its length. For your own safety and the preservation of the park, please obey posted signs and keep to designated trails. Shortcutting trails destroys plant life and soil structure. There are excellent scuba diving opportunities. Scuba diving provides a closeup look at the abundant marine life and a 3metre bronze mermaid statue. The Emerald Princess statue and wheelchair access ramp were placed in the park through efforts of local scuba enthusiasts. There is a diver change house and cold showers are available. Scuba rentals are available in Powell River approximately 27 km north. Good summer swimming in the ocean is available. There is no designated or roped-off swimming area. The beach is quite rocky with some sandy areas at high tide at the day-use site. Caution: beaches are rocky and subject to tidal action and sudden changes in weather. Mermaid Cove is best suited for experienced scuba divers. There are no lifeguards on duty at provincial parks. Typical marine shoreline environment with opportunities to view seals, otters, mink, seabirds and bald eagles. There is a concrete boat launch in the day-use area 1.5 km north of the campground; double ramp and tie up groin; no closures, parking for trailers available. No commercial activity is permitted at boat launches in BC Parks. Overnight parking is available at the owner’s risk. Boats cannot be left in the water or beached overnight. There is a marina 1 km south by boat or car to moor boats over night. Campfires are permitted in designated fire rings only. There is a fire ring in each campsite. Firewood is available for $7 per bundle or 3 bundles for $20 from the campground host, or you can bring your own. Fees for firewood are set locally and may vary. To preserve vegetation and ground cover, please don't gather firewood from the area around your campsite or elsewhere in the park. Dead wood is an important habitat element for many plants and animals and it adds organic matter to the soil. You can conserve firewood and air quality by keeping your campfire small. Limited burning hours or campfire bans may be implemented and some parks may use communal fire rings. Be prepared to bring a portable stove for cooking. There are 5 water taps located throughout the campground. Taps are shut off during the off-season. This park has a day-use/picnic area. There are no covered shelters available. The day-use area is located 1 km from the campgrounds. There is a concrete boat ramp, hand pump for water, grassy area, large paved parking lot and two wheelchair accessible pit toilets. The beach is mostly rocky with some sandy areas at high tide. No fires are permitted in the day-use area. This park only has pit toilets – no flush toilets. There are 6 pit toilets (2 are wheelchair accessible) in the campground, 1 at Mermaid Cove (wheelchair accessible) and 2 at the day-use area (all are wheelchair accessible). This park offers 42 vehicle accessible campsites. There are 2 double sites and no pull-through sites. Campsites are located under mature forest canopy. There is no gatehouse or locked gate. There is room for two vehicles at each site and extra parking is available for a fee. If no staff is available to help find a site, find an unoccupied site that has no camping receipt posted at the site. Pay for camping by self-registration. There is a pay phone located approximately 1 km away at the ferry terminal south of the park. The closest store is in Black Point enroute to Powell River approximately 6 km away. Campsite reservations are accepted and first-come, first-served sites are also available. There are 2 wheelchair accessible pit toilets in the campground, 1 at Mermaid Cove and 2 at the day-use site. A disabled access ramp for scuba divers is best used during high tide at Mermaid Cove. All campsites are accessible to wheelchairs although there are no other furniture or facilities.